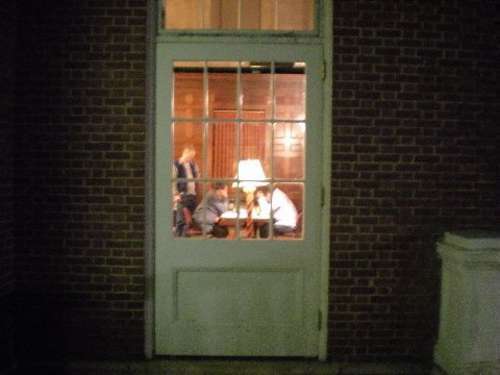 10.13.08 The Maine Rating Floor Open and Rated Beginners Open (RBO) played at Bowdoin College on October 11, 2008 attracted 40 players. Winners were Jason Spector, Joel Knight and Andrew Seavey in the Open, Reserve and RBO sections respectively. 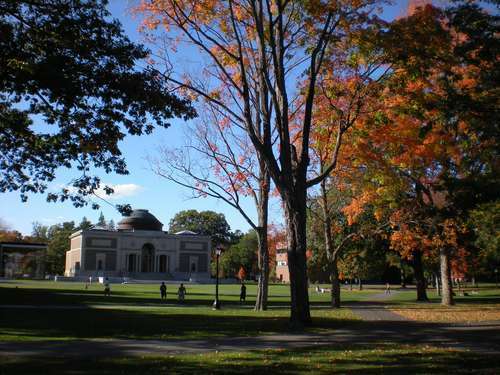 Thanks to Dan Fishbein, Phil Lowell, and Roger Morin for contributing to this report. 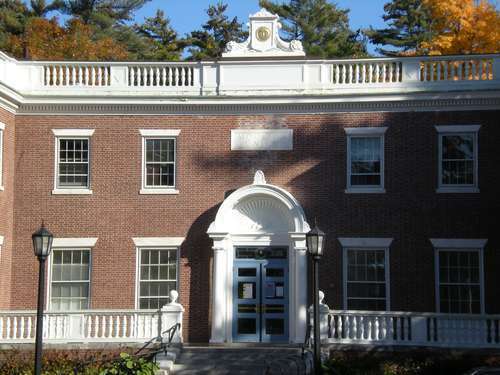 Thanks also to Jason Spector for providing the tournament room at Bowdoin College. After two rounds in the open section there was a six-way tie for first at 1.5 points as a result of the top six players all scoring draws in that round. In round 3, Roger Morin and Lucas McCain played to another draw and fell 1/2 point off the lead going into the final round. Playing the white pieces, Jason Spector defeated Ruben Babayan in round 4 and won the tournament with 3.5 points. The top under 2010 prize was split between Morin and McCain (3.0 points). The top under 1810 prize was shared between Barry Magda and Nick Parsons (2.0 points). In the reserve section, Lee Doucette and Joel Knight played to a draw in round 1 then each won their next two games putting them tied for 1st entering the final round. 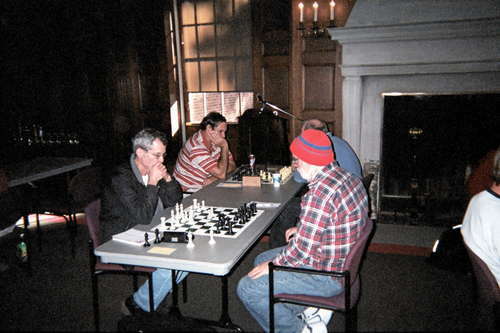 Knight, playing the black pieces, beat Max Berube while Doucette lost his game vs. John Jones. That left unrated Joel Knight the winner of the reserve section and $150 richer. In the RBO, Andrew Seavey defeated Jack Demeter in round 3 giving him a perfect three-for-three going into the last round. Seavey continued his winning ways at the expense of J. Paul Ciarrocchi and finished with 4.0 points. Wesley Parker won the battle for 2nd place with his win over Ethan Dininno in the final round. Tied for 3rd-4th were Olympia Serban and David Rice. Olympia scored 3-1 vs. adult male players all of whom have been inducted into the Olympia Serban club, which may someday rival the Vera Menchik club! 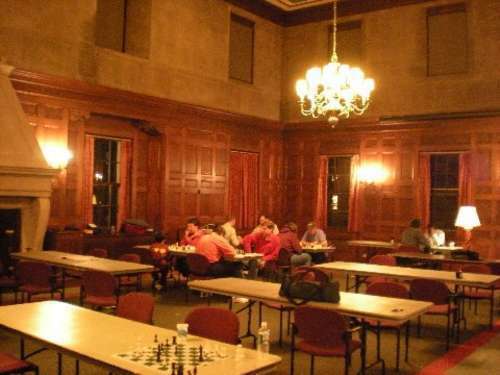 The beautiful room at the historic Moulton Union at Bowdoin College where the tournament was played. The room had a 25 foot ceiling, wood walls above which there was granite, and a huge fireplace. Tournament winner Jason Spector (left) plays Philip Lowell in round 3. Spector won this game to give him 2.5 points going into the last round. Spector plays Ruben Babayan in the final round. The Spector - Babayan game continues late into the night. Spector pulled out the win to finish the tournament with 3.5 points and 1st place. Lucas McCain (left) and Roger Morin play to a draw in round 3 while Andrey Savov prepares for his round 3 opponent, Ruben Babayan. Barry Magda (foreground right) faces off against Curt Brock in a game he eventually won and Chuck Cannone (background right) plays Nick Parsons in a winning effort. 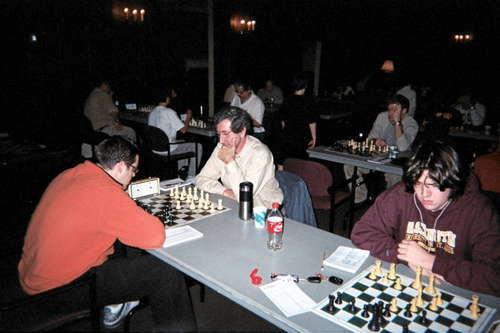 Matthew Fishbein (foreground right) strikes a familiar standing pose during his game in the open section with Rob Shore while Lee Doucette (background right), who placed 3rd in the reserve section, plays Max Berube. 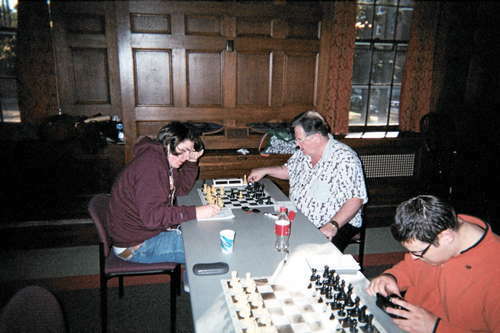 Reserve section winner Joel Knight (foreground left) plays Frank DiRenzo while John Ellison plays John Jones, who placed 2nd in the reserve section, in round 3. Two of the top boards in the open section: Andrey Savov (left) plays the black pieces vs. Ruben Babayan while Lucas McCain plays an absent Roger Morin. Barry Magda (left) gets his turn playing Lucas McCain. 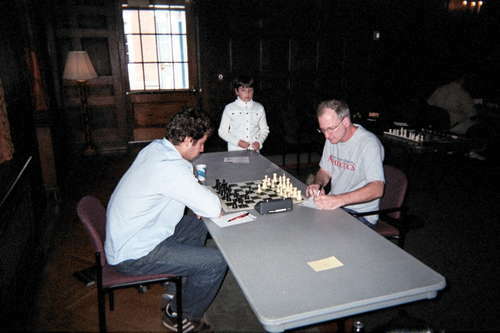 Roger Morin (left) plays Curt Brock in the final round. Cape Elizabeth fielded ten players! But there's only nine pictured you say? That's because John Demarco was the photographer. The others are (left to right) front row: Wesley Parker, Matthew Fishbein, Jack Demeter; second row: Joey Demarco, Vince Demarco; back row: Dr. Mark Parker, Tony Demarco, Ethan Dinnino and Dan Fishbein. 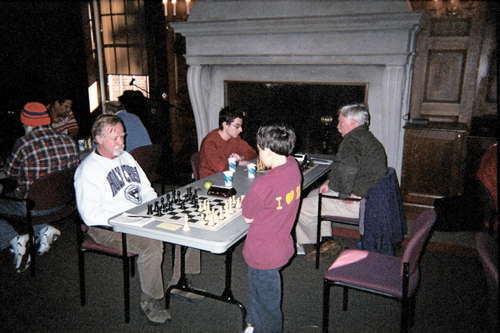 Cape's contingent included 3 chess dads all of whom played. 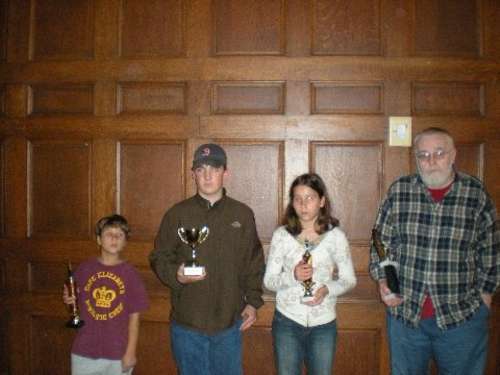 RBO winners (left to right): Wesley Parker (2nd), Andrew Seavey (1st), Olympia Serban and David Rice (tied for 3rd-4th).